[XPB-3716X-XCAR] Book Deposit Collection Boxes are constructed entirely in Aluminum and are 16.375”W x 17”D x 56.75”H. 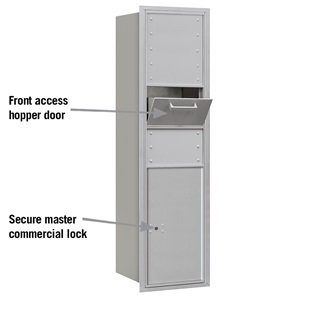 Secure locking Collection Boxes are accessed from the front. The Book Deposit Collection Boxes feature a durable powder coated finish available in four (4) contemporary colors. Custom engraved placards and custom colors are available as options upon request. For shipping quotes, orders or questions please call our Customer Service Center at 1-877-483-9270.